For most Americans Sunday should be a day of rest, but for us on the Launch Pad it is not. It’s hard to describe the workload on the Pad workers right now. This next flight will be our first off Pad 39B, which means we are breaking in a new launch pad at the same time we are trying to get the program back on schedule. After Challenger launches we will have two launch pads operational and another one that will become operational at Vandenberg AFB in six months. We will need all three launch pads if we are going to be able to meet the needs of the ramped up space program. We are in the process of training a lot of people to staff all three launch pads but after we have a few launches under our belt it will all fall into place. Each Orbiter goes through a series of ‘handoffs’ as it moves through the launch preparation phases. The current mission’s Orbiter, Challenger, landed at Edwards AFB on November 6, 1985, which ended its STS-61A mission. It was then prepped for riding on the back of a Boeing 747 back to Kennedy Space Center (KSC) where it arrived on November 11th. 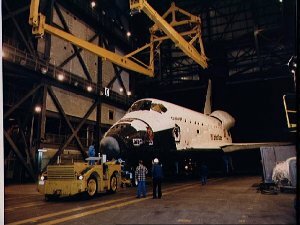 Challenger was then put in the Orbiter Processing Facility (OPF) for just over a month where it was prepped for this mission. On December 16th it was moved to the Vertical Assembly Building (VAB) where the External Tank (ET) and the two Solid Rocket Boosters (SRB’s) were mated to the Orbiter. Six days later (December 22, 1985) STS-51L rolled out to Launch Pad 39B where it is our job to prepare and maintain the ship until it launches next week. Each ship goes through the same process. To have two launches a month, as is our goal, we will become a factory-like operation that flawlessly performs every duty, every day, 24 hours a day. We will truly be the most unique cargo operation in the world and the most vital for our country. We learn as much science and technology from every launch as the real scientists who fly our ships into space. With every new launch we are revising, updating and perfecting our skills. Twenty years from now my children will know that their Dad was one of the people who made America the country that has the best, and possibly only, space port in the world! It makes me proud to be a part of history.